Wearables that detect your heart beat and externalize it as pulses of light. Sensors read the wearer's EKG and produce flashes of light in time with his/her own heart. Wearing the shirt gives an intense feeling of life and rhythm, while at the same time reminding you of your electrical and mechanical roots. It's truly amazing how much the heart responds to social interaction and yet is almost entirely ignored as it meters our life. Heart-felt Shirt Kit For Sale! Pulsing with every beat, the Heart-felt Wristband also changes color from blue to red as your heart rate slows down or speeds up. Modify it to be worn as a wristband, belt buckle or even as a medallion... put a little heart into your bling! Also see my other biofeedback wearables / wearable computing accessories. The following materials were prepared for a studio (workshop) "Measuring Biological Signals: Concepts and Practice" presented at the Tangible and Embedded Embodied Interactions conference, MIT Media Lab, Boston, MA. 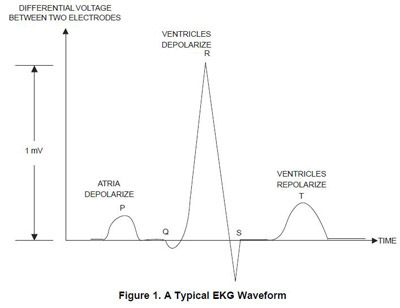 Here is a schematic of the electrocardiogram (a.k.a. 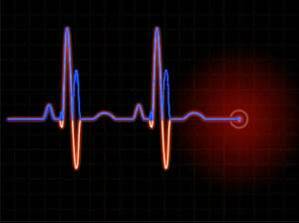 ECG or EKG) signal, identifying the physical events that correspond to each of the observed electrical deflections as recorded from two electrodes places on right and left sides of the chest. 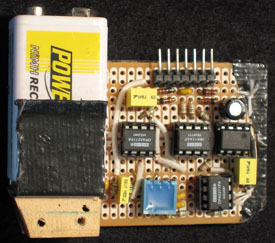 The first step is to amplify and buffer signal into a range that can be detected with common circuitry. Below is a common circuit with a driven right leg (DRL), commonly used to reduce noise using common-mode rejection. 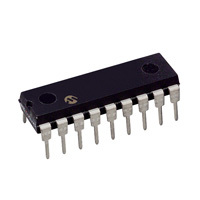 Here is a similar amplifier circuit soldered together. 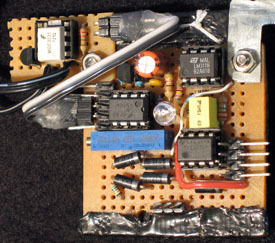 Note that this is just the analog portion of the circuit, amplifying the signal. The circuit works quite well, athough can be overrun by really heavy noise created by other electronics (especially el-wire). (1) Electrodes are reversed and the large peak is negative. (2) The signal size can vary by a factor of 10 depending on individual differences and electrode placement. (1) Rectify the signal, making all peaks positive (above the baseline), turning the red signal into the blue signal seen here. This leads to 2 peaks in rapid succession, but this can easily be dealt with. 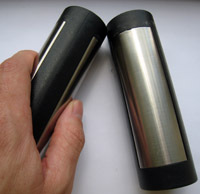 (2) Detect the peaks using a "leaky peak detector". Whenever the EKG hits the threshold (green) it detects a beat and pushes the threshold up to the highest value of the EKG. After the peak, the threshold then slowly decays back down until another beat pushes it up. With an appropriate timescale for decay, this method ensures that any beat that is above the noise, no matter how large or small, will be detected. I initially performed these operations using all analog circuitry (left). 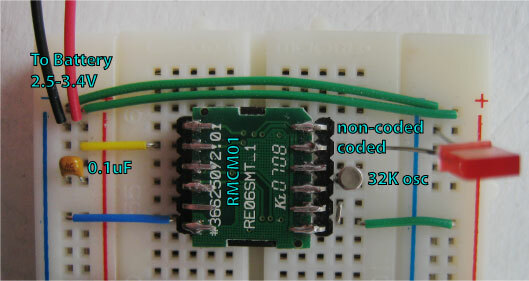 A microcontroller is much simpler (right). More recently, several off-the-shelf solutions have come onto the market from companies selling exercise straps. You buy a strap, put it on, and it takes care of all the heart beat detection and wirelessly sends it to a specialized receiver chip. The transmitter strap is set to go. Just follow the instructions: Get it wet and put it on. 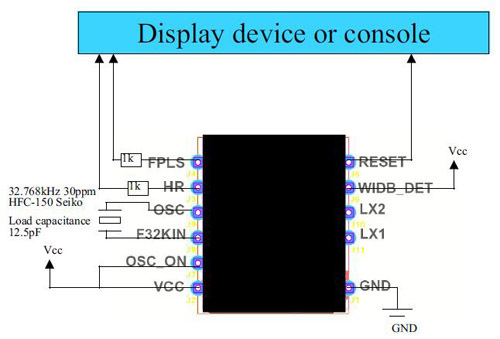 The receiver requires some minimal setup diagrammed below. 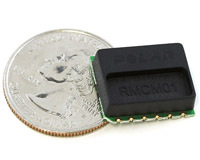 There are two outputs from the RMCM01 that display a pulse for each heartbeat. The "coded" output works with transmitters like the wearlink+ that send a device ID with each signal. The coded signal permits multiple users in close proximity to be accurately tracked by their respective receivers. The non-coded output displays all detected heartbeats from all nearby transmitters including those sent by older Polar straps that did not have a coded feature. (1) The wireless signal is transmitted at 5.5kHz, which can get interference from some electronics, such as el-wire/panel. Other companies' products (Garmin, Sunto), may deal with this better. (2) The Polar strap generally works very well. I found that over time, however, it can begin it to lose effectiveness, at which point you may need to buy a replacement strap for ~$15. For my own purposes, I switched to using a gel electrode attached to the transmitter via snaps on a homemade strap. I like the Kendall 7305 Biotac Ultra Foam Electrodes because they don't damage your skin the way 3M does, but get a good signal and can be reused several times. Monitoring your EKG from your hands! Great for installation art! !